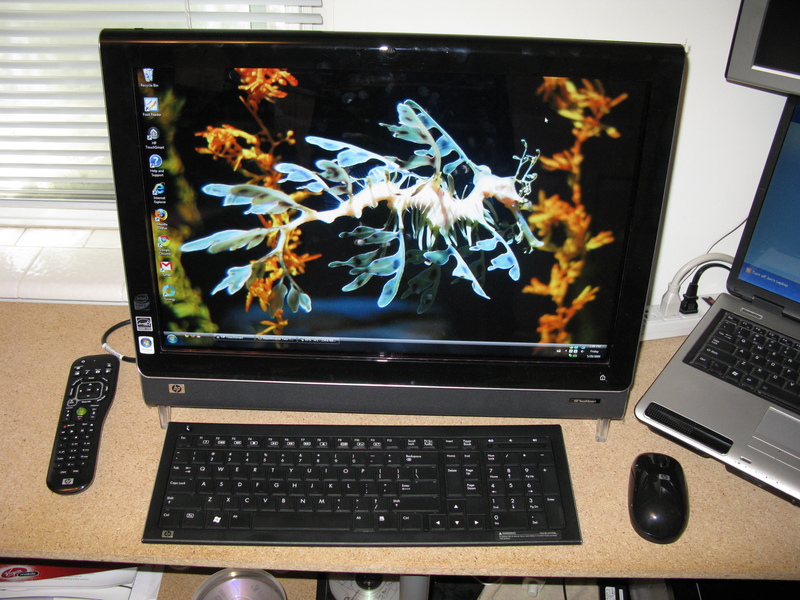 So I went and spent some money, (again) and got an HP TouchSmart (an IQ526 from the 22″ widescreen IQ 500 series). Made by HP, but surprisingly, didn’t have nearly as much preinstalled junk as usual. The wireless mouse and keyboard work well and at a decent range. Once you get used to the touchscreen responding to the center (I’m used to center of pressure, like my tablet laptop), hitting the “small” buttons on the normal programs (FireFox, Windows, etc.) isn’t very difficult (especially compared to my tablet with its tiny screen but high resolution). Though nothing that comes with the computer supports it directly, and HP is shy on releasing the “drivers,” the touch hardware supports two-point multitouch. The included remote works well, and you can use it to navigate up/down/left/right even outside “TV” (read: Media Center) applications. The internal speakers are much better than I expected. They aren’t tin cans and don’t sound like tin cans. The touchscreen, an IR sensor made by NextWindow, will detect a “press” even a couple millimeters from the glass. The “HP TouchSmat” application it comes with, supposedly the “primary” touch application you will use is crap. Slow, clunky, and it doesn’t support any multitouch when they easily could have (see below). No VESA wall-mounting holes. The larger (screened) model, the IQ800 series, has an adapter bracket you can buy from HP. If you want to wall-mount this model (IQ500), you either need to DIY something or get this compatible wall mount for it. Not the cheapest computer around, but a well-integrated one. For some random reason (probably crap software I haven’t removed yet…) my F3 keypresses get intercepted and instead the volume jumps up and down and mutes like a ghost is around. For the most part, I’m pretty impressed with it. Right now it’s just sitting next to my main computer until I can get it to a more permanent home in or near kitchenspace. 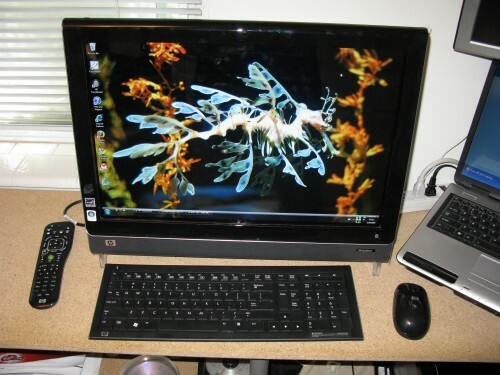 The touchscreen is made by NextWindow and almost fully supports two-finger multi-touch. You can tweak the options and remove the annoy beep permanently by downloading their Touch+ software suite. The TouchSmart has a USB (not Serial) interface. When the config screen pops up and says “USB Device not connected” just wait a second. It will detect it then give you the options. Change the sound “time” to zero and save it the the device’s permanent memory. If you are into Windows 7 (which apparently supports multitouch), the drivers for it are here. It also has an API that programmers can use to get to the multiple touches with. I haven’t found anything that will bridge this input with TUIO, the protocol used in most of today’s multi-touch software, yet. (Well, I did find one that might work from a commercial manufacturer, but I’m not looking to spend money on this point because:) I will probably just build my own bridge myself later. Google around or go some where to download TUIO-enabled (multi-touch) programs. (Optional, but needed for some TUIO applications) Go to Pen and Input Devices in your Control Panel and, under touch, uncheck “User your finger as an input device.” This will prevent certain applications from interpreting mouse clicks and finger touches on the smae point as two different touches. For flash-based TUIO apps that have a .swf instead of a .exe extension: Go to your Flash settings and enable exceptions for the TUIO .swf files you want to use. Then get the projector (choose the “Flash Player 9 Projector content debugger”). Open the .swf with this application (usually you can double-click the .swf after you instlal the projector). Once it’s open, press ctrl-f to make it full screen (if it’s not), then . . .
touchlib is one of the more common multi-touch libraries out there. Out of the box it supports grabbing input from a video capture device (usually a infrared modified USB camera) and turning the images to touch points. From there the interpreted data is passed to a FlashOSC server that translates the data and relays it to a local (or remote) port that Flash applications can read from. The data is sent in TUIO format, which is an extension/subset of the Open Sound Control (a “descendant” of the MIDI protocol). I might have to build a real touchwall one of these days. This isn’t exactly brand new, but hey, I thought I’d throw it up anyway. I guess I have an obsession for many motitors and screen space. Left 2 monitors: laptop and its second head. Topmost monitor (on the shelf): tablet laptop. Main 4 monitors: 22″ widescreens. Two are connected to a GeForce 8800 GTX (lower) and two are connected to a GeForce 9800 GT. The combined resolution of just these four monitors alone is over 7 million pixels. Mouse: Logitech G5: one of the best mouses out there. Linksys router: Running DD-WRT this acts as a wireless network bridge to the network upstairs, where the modem is. Keyboard/nanoKontrol/nanoPad – Some misc. MIDI devices for a sound project I’ve been working on. 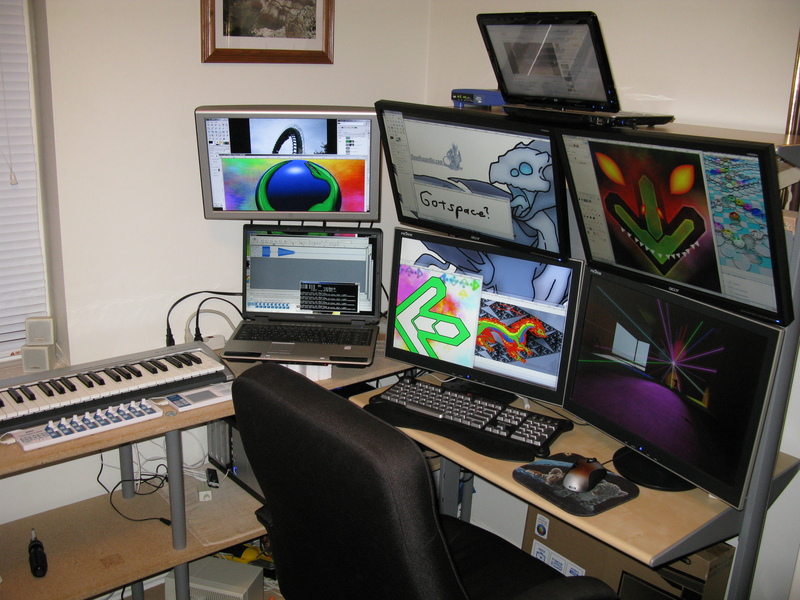 Using Synergy I can control all three computers with one mouse/keyboard.